2. Caramoy A, Engel L, Koch KR, Kirchhof B, Cursiefen C, Heindl LM. Multiple imaging modalities for the detection of optic nerve head drusen: Is echography still mandatory? Acta ophthalmologica 2016. 3. Schlereth SL, Kremers S, Schrodl F, Cursiefen C, Heindl LM. Characterization of Antigen-Presenting Macrophages and Dendritic Cells in the Healthy Human Sclera. Investigative ophthalmology & visual science 2016;57:4878-4885. 4. Hoerster R, Schlaak M, Koch KR, Ortmann M, Mauch C, Heindl LM. [Merkel cell carcinoma of the eyelid. An often unrecognized tumor entity: Clinical aspects and treatment strategies]. Der Ophthalmologe : Zeitschrift der Deutschen Ophthalmologischen Gesellschaft 2016. 5. Schaub F, Adler W, Koenig MC, Enders P, Grajewski RS, Cursiefen C, Heindl LM. Impact of allergy and atopy on the risk of pseudophakic cystoid macular edema. Graefe's archive for clinical and experimental ophthalmology = Albrecht von Graefes Archiv fur klinische und experimentelle Ophthalmologie 2016. 6. Schaub F, Enders P, Zachewicz J, Heindl LM, Stanzel TP, Cursiefen C, Bachmann BO. Impact of donor age on Descemet membrane endothelial keratoplasty (DMEK) outcome: Evaluation of donors aged 17 - 55 years. American journal of ophthalmology 2016. 7. Koch KR, Kopecky A, Heindl LM. [Management of Periocular Soft Tissue Injuries]. Klinische Monatsblatter fur Augenheilkunde 2016. 8. Grajewski RS, Koch KR, Koch HR, Ciotu IM, Cursiefen C, Heindl LM. Cataract in pseudohypoparathyroidism. Journal of cataract and refractive surgery 2016;42:1094-1096. 9. Enders P, Schaub F, Adler W, Nikoluk R, Hermann MM, Heindl LM. The use of Bruch's membrane opening-based optical coherence tomography of the optic nerve head for glaucoma detection in microdiscs. The British journal of ophthalmology 2016. 10. Grajewski RS, Boelke AC, Adler W, Meyer S, Caramoy A, Kirchhof B, Cursiefen C, Heindl LM. Spectral-domain optical coherence tomography findings of the macula in 500 consecutive patients with uveitis. Eye 2016. 11. Hishmi AM, Koch KR, Matthaei M, Bolke E, Cursiefen C, Heindl LM. Modified Hughes procedure for reconstruction of large full-thickness lower eyelid defects following tumor resection. European journal of medical research 2016;21:27. 12. Lentzsch AM, Gobel H, Heindl LM. Primary Orbital Hydatid Cyst. Ophthalmology 2016;123:1410. 13.	van Setten GB, Trost A, Schrodl F, Kaser-Eichberger A, Bogner B, van Setten M, Heindl LM, Grabner G, Reitsamer HA. Immunohistochemical Detection of CTGF in the Human Eye. Current eye research 2016;1-9. 14. 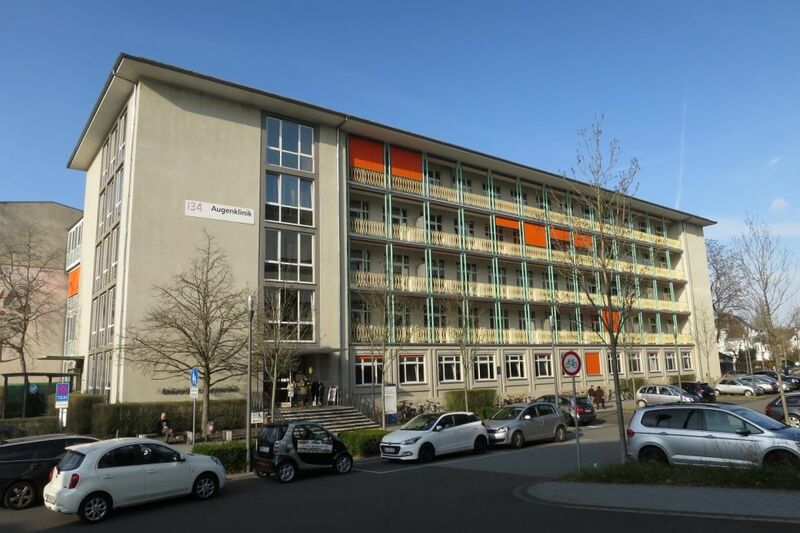 Matthaei M, Sandhaeger H, Hermel M, Adler W, Jun AS, Cursiefen C, Heindl LM. Changing Indications in Penetrating Keratoplasty: A Systematic Review of 34 Years of Global Reporting. Transplantation 2016. 15. Schaub F, Simons HG, Enders P, Bachmann BO, Roters S, Cursiefen C, Heindl LM. [Corneal donation: Dilemma between growing demand and declining donor rate]. Der Ophthalmologe : Zeitschrift der Deutschen Ophthalmologischen Gesellschaft 2016. 16.	von Goscinski C, Koch KR, Cursiefen C, Heindl LM. [Tumors of the lacrimal drainage system]. Hno 2016;64:386-393. 17. Schlereth SL, Kremers S, Cursiefen C, Heindl LM. Using a Laminating Technique to Perform Confocal Microscopy of the Human Sclera. Journal of visualized experiments : JoVE 2016. 18. Koch KR, Heindl LM. Axenfeld Loop vs Extrasclerally Extending Ciliary Body Tumor-Reply. JAMA ophthalmology 2016;134:846. 19. Enders P, Schaub F, Hermann MM, Cursiefen C, Heindl LM. Neuroretinal rim in non-glaucomatous large optic nerve heads: a comparison of confocal scanning laser tomography and spectral domain optical coherence tomography. The British journal of ophthalmology 2016. 20. Bucher F, Fricke J, Neugebauer A, Cursiefen C, Heindl LM. Ophthalmological manifestations of Parry-Romberg syndrome. Survey of ophthalmology 2016. 21. Siggel R, Adler W, Stanzel TP, Cursiefen C, Heindl LM. Bilateral Descemet Membrane Endothelial Keratoplasty: Analysis of Clinical Outcome in First and Fellow Eye. Cornea 2016. 22. Schaub F, Simons HG, Roters S, Heindl LM, Kugler W, Bachmann BO, Cursiefen C. [Influence of 20 % sulfur hexafluoride (SF6) on human corneal endothelial cells : An in vitro study]. Der Ophthalmologe : Zeitschrift der Deutschen Ophthalmologischen Gesellschaft 2016;113:52-57. 23. Schaub F, Enders P, Cursiefen C, Heindl LM. Split-cornea transplantation - a microbiologically safe approach? Graefe's archive for clinical and experimental ophthalmology = Albrecht von Graefes Archiv fur klinische und experimentelle Ophthalmologie 2016. 24. Matthaei M, Gillessen J, Muether PS, Hoerster R, Bachmann BO, Hueber A, Cursiefen C, Heindl LM. Author Response: Transforming Growth Factor Beta Switch in Aqueous Humor of Patients With Fuchs' Endothelial Corneal Dystrophy. Investigative ophthalmology & visual science 2016;57:773. 25. Koch KR, Trester W, Muller-Uri N, Trester M, Cursiefen C, Heindl LM. [Ocular prosthetics : Fitting, daily use and complications]. Der Ophthalmologe : Zeitschrift der Deutschen Ophthalmologischen Gesellschaft 2016;113:133-142. 26. Koch KR, Ortmann M, Heindl LM. Conjunctival Mucoepidermoid Carcinoma. Ophthalmology 2016;123:616. 27. Koch KR, Cursiefen C, Heindl LM. [Transcanalicular Laser Dacryocystorhinostomy: One-Year-Experience in the Treatment of Acquired Nasolacrimal Duct Obstructions]. Klinische Monatsblatter fur Augenheilkunde 2016;233:182-186. 28. Hos D, Bucher F, Regenfuss B, Dreisow ML, Bock F, Heindl LM, Eming SA, Cursiefen C. IL-10 Indirectly Regulates Corneal Lymphangiogenesis and Resolution of Inflammation via Macrophages. The American journal of pathology 2016;186:159-171. 29. Grajewski RS, Bosch JJ, Bruns H, Cursiefen C, Heindl LM. The Trojan Horse Tale Revisited: An Eye on Metastatic Spread of Carcinoma Cells. Cancer immunology research 2016;4:92-94. 30. Boppudi S, Bogershausen N, Hove HB, Ferda Percin E, Aslan D, Dvorsky R, Kayhan G, Li Y, Cursiefen C, Tantcheva-Poor I, Toft PB, Bartsch O, Lissewski C, Jakubiczka S, Wollnik B, Ahmadian MR, Heindl LM, Zenker M. Specific mosaic KRAS mutations affecting codon 146 cause oculoectodermal syndrome and encephalocraniocutaneous lipomatosis. Clinical genetics 2016. 31. Avgitidou G, Koch KR, Fries JW, Cursiefen C, Heindl LM. [Pediatric conjunctival tumor with cilia]. Der Ophthalmologe : Zeitschrift der Deutschen Ophthalmologischen Gesellschaft 2016. 32. Tempfer H, Kaser-Eichberger A, Korntner S, Lehner C, Kunkel N, Traweger A, Trost A, Strohmaier C, Bogner B, Runge C, Bruckner D, Krefft K, Heindl LM, Reitsamer HA, Schrodl F. Presence of lymphatics in a rat tendon lesion model. Histochemistry and cell biology 2015;143:411-419. 33. Siggel R, Heindl LM, Cursiefen C. Descemet membrane endothelial keratoplasty (DMEK) in phakic eyes with shallow anterior chamber. Graefe's archive for clinical and experimental ophthalmology = Albrecht von Graefes Archiv fur klinische und experimentelle Ophthalmologie 2015;253:817-819. 34. Schuler-Thurner B, Bartz-Schmidt KU, Bornfeld N, Cursiefen C, Fuisting B, Grisanti S, Heindl LM, Holbach L, Keseru M, Knorr H, Koch K, Kruse F, Meiller R, Metz C, Meyer-ter-Vehn T, Much M, Reinsberg M, Schliep S, Seitz B, Schuler G, Susskind D, Viestenz A, Wagenfeld L, Zeschnigk M. [Immunotherapy of uveal melanoma: vaccination against cancer. Multicenter adjuvant phase 3 vaccination study using dendritic cells laden with tumor RNA for large newly diagnosed uveal melanoma]. Der Ophthalmologe : Zeitschrift der Deutschen Ophthalmologischen Gesellschaft 2015;112:1017-1021. 35. Schrodl F, Kaser-Eichberger A, Trost A, Strohmaier C, Bogner B, Runge C, Motloch K, Bruckner D, Laimer M, Heindl LM, Reitsamer HA. Lymphatic Markers in the Adult Human Choroid. Investigative ophthalmology & visual science 2015;56:7406-7416. 36. Schlereth SL, Iden S, Mescher M, Ksander BR, Bosch JJ, Cursiefen C, Heindl LM. A Novel Model of Metastatic Conjunctival Melanoma in Immune-Competent Mice. Investigative ophthalmology & visual science 2015;56:5965-5973. 37. Schaub F, Cursiefen C, Heindl LM. Retrospective Appraisal of Split-Cornea Transplantation: An Audit of 1141 Donor Corneas. JAMA ophthalmology 2015;133:1086-1087. 38. Refaian N, Schlereth SL, Koch KR, Notara M, Hos D, Mescher M, Iden S, Bosch JJ, Jager MJ, Cursiefen C, Heindl LM. Comparing the Hem- and Lymphangiogenic Profile of Conjunctival and Uveal Melanoma Cell Lines. Investigative ophthalmology & visual science 2015;56:5691-5697. 39. Matthaei M, Gillessen J, Muether PS, Hoerster R, Bachmann BO, Hueber A, Cursiefen C, Heindl LM. Epithelial-Mesenchymal Transition (EMT)-Related Cytokines in the Aqueous Humor of Phakic and Pseudophakic Fuchs' Dystrophy Eyes. Investigative ophthalmology & visual science 2015;56:2749-2754. 40. Kopecky A, Koch KR, Bucher F, Cursiefen C, Heindl LM. [Results of Cutler-Beard procedure for reconstruction of extensive full thickness upper eyelid defects following tumor resection]. 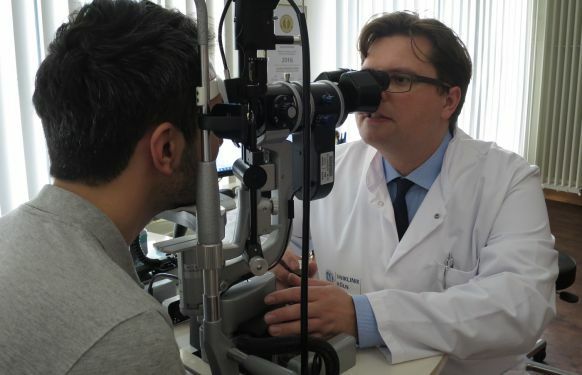 Der Ophthalmologe : Zeitschrift der Deutschen Ophthalmologischen Gesellschaft 2015. 41. Koch KR, Ortmann M, Heindl LM. Extraocular Extension of a Benign Ciliary Body Nevus. JAMA ophthalmology 2015;133:e153137. 42. Koch KR, Matthaei M, Grau SJ, Blau T, Bolke E, Schlichting O, Cursiefen C, Heindl LM. Benign orbital angiomatous tumors with intracranial extension. European journal of medical research 2015;20:63. 43. Koch KR, Kuhner H, Cursiefen C, Heindl LM. [Significance of transcanalicular laser assisted dacryocystorhinostomy in modern lacrimal drainage surgery]. Der Ophthalmologe : Zeitschrift der Deutschen Ophthalmologischen Gesellschaft 2015;112:122-126. 44. Khatib R, Gobel H, Kurschat C, Rocken C, Cursiefen C, Steven P, Heindl LM. [Refractory pseudofollicular conjunctivitis]. 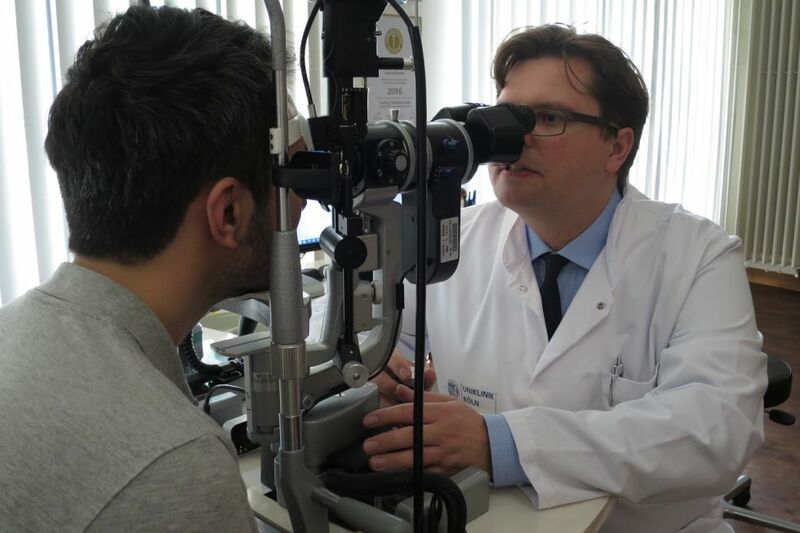 Der Ophthalmologe : Zeitschrift der Deutschen Ophthalmologischen Gesellschaft 2015. 45. Kaser-Eichberger A, Schrodl F, Trost A, Strohmaier C, Bogner B, Runge C, Motloch K, Bruckner D, Laimer M, Schlereth SL, Heindl LM, Reitsamer HA. Topography of Lymphatic Markers in Human Iris and Ciliary Body. Investigative ophthalmology & visual science 2015;56:4943-4953. 46. Hos D, Schlereth SL, Bock F, Heindl LM, Cursiefen C. Antilymphangiogenic therapy to promote transplant survival and to reduce cancer metastasis: what can we learn from the eye? Seminars in cell & developmental biology 2015;38:117-130. 47. Hos D, Heindl LM, Bucher F, Cursiefen C. Novel lamellar, flap-based tattooing techniques for corneal opacities in scarred and vascularized blind eyes. Cornea 2015;34:82-86. 48. Heindl LM, Siebelmann S, Dietlein T, Huttmann G, Lankenau E, Cursiefen C, Steven P. Future prospects: assessment of intraoperative optical coherence tomography in ab interno glaucoma surgery. Current eye research 2015;40:1288-1291. 49. Heindl LM, Koch KR, Schlaak M, Mauch C, Cursiefen C. [Adjuvant therapy and interdisciplinary follow-up care of conjunctival melanoma]. Der Ophthalmologe : Zeitschrift der Deutschen Ophthalmologischen Gesellschaft 2015;112:907-911. 50. Heindl LM, Kaser-Eichberger A, Schlereth SL, Bock F, Regenfuss B, Reitsamer HA, McMenamin P, Lutty GA, Maruyama K, Chen L, Dana R, Kerjaschki D, Alitalo K, De Stefano ME, Junghans BM, Schroedl F, Cursiefen C. Sufficient Evidence for Lymphatics in the Developing and Adult Human Choroid? Investigative ophthalmology & visual science 2015;56:6709-6710. 51. Heindl LM, Cursiefen C. [Conjunctival melanoma: a systemic disease: Novel surgical and adjuvant therapies]. Der Ophthalmologe : Zeitschrift der Deutschen Ophthalmologischen Gesellschaft 2015;112:890-891. 52. Grajewski RS, Heindl LM. Macular thickening of uveitic eyes in the absence of macular oedema and epiretinal membranes. Acta ophthalmologica 2015. 53. Grajewski RS, Caramoy A, Frank KF, Rubbert-Roth A, Fatkenheuer G, Kirchhof B, Cursiefen C, Heindl LM. Spectrum of Uveitis in A German Tertiary Center: Review of 474 Consecutive Patients. Ocular immunology and inflammation 2015;1-7. 54. Damasceno RW, Avgitidou G, Belfort R, Jr., Dantas PE, Holbach LM, Heindl LM. Eyelid aging: pathophysiology and clinical management. Arquivos brasileiros de oftalmologia 2015;78:328-331. 55. Bucher F, Simons HG, Cursiefen C, Heindl LM. Phacodyne versus VisionBlue as vital dyes in Descemet membrane endothelial keratoplasty. Graefe's archive for clinical and experimental ophthalmology = Albrecht von Graefes Archiv fur klinische und experimentelle Ophthalmologie 2015;253:1411-1412. 56. Bucher F, Schneider C, Blau T, Cursiefen C, Fink GR, Lehmann HC, Heindl LM. Small-Fiber Neuropathy Is Associated With Corneal Nerve and Dendritic Cell Alterations: An In Vivo Confocal Microscopy Study. Cornea 2015;34:1114-1119. 57. Bucher F, Hos D, Muller-Schwefe S, Steven P, Cursiefen C, Heindl LM. Spontaneous long-term course of persistent peripheral graft detachments after Descemet's membrane endothelial keratoplasty. The British journal of ophthalmology 2015;99:768-772. 58. Bucher F, Fries JW, Hos D, Koch KR, Cursiefen C, Heindl LM. [Prolapse of the upper lacrimal punctum]. Der Ophthalmologe : Zeitschrift der Deutschen Ophthalmologischen Gesellschaft 2015;112:788-790. 59. Bucher F, Fricke J, Cursiefen C, Heindl LM. Trigeminal involvement in parry-romberg syndrome: an in vivo confocal microscopy study of the cornea. Cornea 2015;34:e10-11. 60. Avgitidou G, Siebelmann S, Bachmann B, Kohlhase J, Heindl LM, Cursiefen C. Brittle Cornea Syndrome: Case Report with Novel Mutation in the PRDM5 Gene and Review of the Literature. Case reports in ophthalmological medicine 2015;2015:637084. 61. Avgitidou G, Koch KR, Cursiefen C, Heindl LM. [Current aspects of eyelid, lacrimal and orbital surgery in childhood]. Der Ophthalmologe : Zeitschrift der Deutschen Ophthalmologischen Gesellschaft 2015;112:102-109. 62. Avgitidou G, Koch KR, Cursiefen C, Heindl LM. [In Process Citation]. Der Ophthalmologe : Zeitschrift der Deutschen Ophthalmologischen Gesellschaft 2015;112:605-606. 63. Avgitidou G, Cursiefen C, Heindl LM. [Ophthalmological manifestations of Cornelia de Lange syndrome: Case report and review of the literature]. Der Ophthalmologe : Zeitschrift der Deutschen Ophthalmologischen Gesellschaft 2015;112:455-458. 64. Steven P, Le Blanc C, Lankenau E, Krug M, Oelckers S, Heindl LM, Gehlsen U, Huettmann G, Cursiefen C. Optimising deep anterior lamellar keratoplasty (DALK) using intraoperative online optical coherence tomography (iOCT). The British journal of ophthalmology 2014;98:900-904. 65. Schroedl F, Kaser-Eichberger A, Schlereth SL, Bock F, Regenfuss B, Reitsamer HA, Lutty GA, Maruyama K, Chen L, Lutjen-Drecoll E, Dana R, Kerjaschki D, Alitalo K, De Stefano ME, Junghans BM, Heindl LM, Cursiefen C. Consensus statement on the immunohistochemical detection of ocular lymphatic vessels. Investigative ophthalmology & visual science 2014;55:6440-6442. 66. Schneider C, Bucher F, Cursiefen C, Fink GR, Heindl LM, Lehmann HC. Corneal confocal microscopy detects small fiber damage in chronic inflammatory demyelinating polyneuropathy (CIDP). Journal of the peripheral nervous system : JPNS 2014;19:322-327. 67. Schlereth SL, Refaian N, Iden S, Cursiefen C, Heindl LM. Impact of the prolymphangiogenic crosstalk in the tumor microenvironment on lymphatic cancer metastasis. BioMed research international 2014;2014:639058. 68. Schlereth SL, Neuser B, Herwig MC, Muller AM, Koch KR, Reitsamer HA, Schrodl F, Cursiefen C, Heindl LM. Absence of lymphatic vessels in the developing human sclera. Experimental eye research 2014;125:203-209. 69. Schlereth SL, Neuser B, Caramoy A, Grajewski RS, Koch KR, Schrodl F, Cursiefen C, Heindl LM. Enrichment of lymphatic vessel endothelial hyaluronan receptor 1 (LYVE1)-positive macrophages around blood vessels in the normal human sclera. Investigative ophthalmology & visual science 2014;55:865-872. 70. Koch KR, Refaian N, Hos D, Schlereth SL, Bosch JJ, Cursiefen C, Heindl LM. Autocrine impact of VEGF-A on uveal melanoma cells. Investigative ophthalmology & visual science 2014;55:2697-2704. 71. Koch KR, Heindl LM, Cursiefen C, Koch HR. Artificial iris devices: benefits, limitations, and management of complications. Journal of cataract and refractive surgery 2014;40:376-382. 72. Hos D, Heindl LM, Bucher F, Cursiefen C. Evidence of donor corneal endothelial cell migration from immune reactions occurring after descemet membrane endothelial keratoplasty. Cornea 2014;33:331-334. 73. Herwig MC, Munstermann K, Klarmann-Schulz U, Schlereth SL, Heindl LM, Loeffler KU, Muller AM. Expression of the lymphatic marker podoplanin (D2-40) in human fetal eyes. Experimental eye research 2014;127:243-251. 74. Heindl LM, Bucher F, Naumann GO, Cursiefen C. Lack of ciliary body lymphatics in iridociliary melanocytoma. Graefe's archive for clinical and experimental ophthalmology = Albrecht von Graefes Archiv fur klinische und experimentelle Ophthalmologie 2014;252:169-171. 75. Heindl LM, Bucher F, Caramoy A, Hos D, Matthaei M, Cursiefen C. Safety of donor tissue preparation and use of descemetoschisis and torn tissue in descemet membrane endothelial keratoplasty. Cornea 2014;33:e7-9. 76. Grajewski RS, Schuler-Thurner B, Mauch C, Kreuzberg N, Koch KR, Bergua A, Cursiefen C, Heindl LM. Ocular diseases in metastatic cutaneous melanoma: review of 108 consecutive patients in two German tertiary centers. Graefe's archive for clinical and experimental ophthalmology = Albrecht von Graefes Archiv fur klinische und experimentelle Ophthalmologie 2014;252:679-685. 77. Grajewski RS, Adler W, Frank KF, Arfaoui M, Schlereth SL, Kirchhof B, Cursiefen C, Heindl LM. Predictive value of serum markers for pulmonary involvement in ocular sarcoidosis. Acta ophthalmologica 2014;92:e250-251. 78. Bucher F, Hos D, Matthaei M, Steven P, Cursiefen C, Heindl LM. Corneal nerve alterations after Descemet membrane endothelial keratoplasty: an in vivo confocal microscopy study. Cornea 2014;33:1134-1139. 79. Bucher F, Adler W, Lehmann HC, Hos D, Steven P, Cursiefen C, Heindl LM. Corneal nerve alterations in different stages of Fuchs' endothelial corneal dystrophy: an in vivo confocal microscopy study. Graefe's archive for clinical and experimental ophthalmology = Albrecht von Graefes Archiv fur klinische und experimentelle Ophthalmologie 2014;252:1119-1126. 80. Avgitidou G, Zhivov A, Heindl LM, Cursiefen C. [Pseudotumor of the cornea in childhood]. Der Ophthalmologe : Zeitschrift der Deutschen Ophthalmologischen Gesellschaft 2014;111:1077-1079. 81. Tourtas T, Heindl LM, Kopsachilis N, Bachmann BO, Kruse FE, Cursiefen C. Use of accidentally torn descemet membrane to successfully complete descemet membrane endothelial keratoplasty. Cornea 2013;32:1418-1422. 82. Steven P, Le Blanc C, Velten K, Lankenau E, Krug M, Oelckers S, Heindl LM, Gehlsen U, Huttmann G, Cursiefen C. Optimizing descemet membrane endothelial keratoplasty using intraoperative optical coherence tomography. JAMA ophthalmology 2013;131:1135-1142. 83. Steven P, Hos D, Heindl LM, Bock F, Cursiefen C. [Immune reactions after DMEK, DSAEK and DALK]. Klinische Monatsblatter fur Augenheilkunde 2013;230:494-499. 84. Steven P, Heindl LM. [Conjunctival infections]. Klinische Monatsblatter fur Augenheilkunde 2013;230:843-855; quiz 856-847. 85. Ristau T, Cursiefen C, Heindl LM. [Pseudo-tumor of the iris following cataract surgery]. Der Ophthalmologe : Zeitschrift der Deutschen Ophthalmologischen Gesellschaft 2013;110:770-772. 86. Riss S, Heindl LM, Bachmann BO, Kruse FE, Cursiefen C. Microbubble incision as a new rescue technique for big-bubble deep anterior lamellar keratoplasty with failed bubble formation. Cornea 2013;32:125-129. 87. Hos D, Koch KR, Bucher F, Bock F, Cursiefen C, Heindl LM. Serum eyedrops antagonize the anti(lymph)angiogenic effects of bevacizumab in vitro and in vivo. Investigative ophthalmology & visual science 2013;54:6133-6142. 88. Hos D, Koch KR, Bock F, Grajewski RS, Dietlein TS, Cursiefen C, Heindl LM. Short- and long-term corneal vascular effects of tafluprost eye drops. Graefe's archive for clinical and experimental ophthalmology = Albrecht von Graefes Archiv fur klinische und experimentelle Ophthalmologie 2013;251:1919-1927. 89. Heindl LM, Schrodl F, Lutjen-Drecoll E, Cursiefen C. Ciliary body lymphangiogenesis. Ophthalmology 2013;120:e41-42. 90. Heindl LM, Riss S, Adler W, Steven P, Hos D, Cursiefen C. Corneal graft alterations after Descemet stripping: implications for split cornea transplantation. JAMA ophthalmology 2013;131:687-689. 91. Heindl LM, Riss S, Adler W, Bucher F, Hos D, Cursiefen C. Split cornea transplantation: relationship between storage time of split donor tissue and outcome. Ophthalmology 2013;120:899-907. 92. Heindl LM, Koch KR, Cursiefen C, Konen W. Optical coherence tomography and ultrasound biomicroscopy in the management of pseudophakic malignant glaucoma. Graefe's archive for clinical and experimental ophthalmology = Albrecht von Graefes Archiv fur klinische und experimentelle Ophthalmologie 2013;251:2261-2263. 93. Heindl LM, Koch KR, Bucher F, Hos D, Steven P, Koch HR, Cursiefen C. Descemet membrane endothelial keratoplasty in eyes with glaucoma implants. Optometry and vision science : official publication of the American Academy of Optometry 2013;90:e241-244; discussion 1029. 94. Cursiefen C, Steven P, Roters S, Heindl LM. [Prevention and management of complications in Descemet membrane endothelial keratoplasty (DMEK) and Descemet stripping automated endothelial keratoplasty (DSAEK)]. Der Ophthalmologe : Zeitschrift der Deutschen Ophthalmologischen Gesellschaft 2013;110:614-621. 95. Cursiefen C, Regenfuss B, Hos D, Bucher F, Steven P, Heindl LM, Bock F. [Anti(lymph)angiogenic preconditioning prior to keratoplasty]. 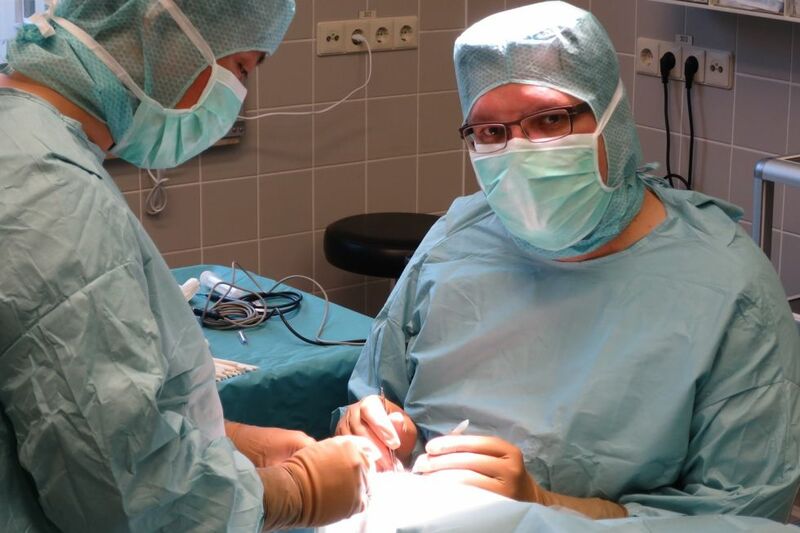 Klinische Monatsblätter für Augenheilkunde 2013;230:500-504. 96. Bucher F, Roters S, Mellein A, Hos D, Heindl LM, Cursiefen C, Hermann M. "OSMO-UT-DSAEK" using THIN-C medium. Graefe's archive for clinical and experimental ophthalmology = Albrecht von Graefes Archiv für klinische und experimentelle Ophthalmologie 2013;251:2181-2185. 97. Bucher F, Dietlein T, Hermann M, Hos D, Cursiefen C, Heindl LM. Retrocorneal membrane formation after Baerveldt shunt implantation for iridocorneal endothelial syndrome. Cornea 2013;32:e161-163. 98. 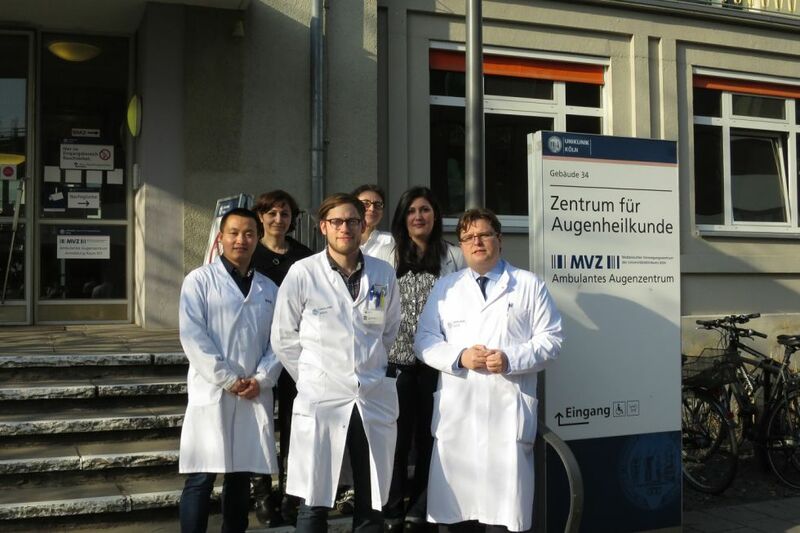 Bock F, Maruyama K, Regenfuss B, Hos D, Steven P, Heindl LM, Cursiefen C. Novel anti(lymph)angiogenic treatment strategies for corneal and ocular surface diseases. Progress in retinal and eye research 2013;34:89-124. 99. Bi Y, Sui G, Zhou Q, Heindl LM, Bock F, Sun X, Tang S, Wang Z, Cursiefen C. Two-step retrograde closed stenting: a novel method for treating canalicular lacerations in Chinese patients. Eye 2013;27:1275-1280. 100. Wessel JM, Hofmann-Rummelt C, Kruse FE, Cursiefen C, Heindl LM. Invasion of lymphatic vessels into the eye after open globe injuries. Investigative ophthalmology & visual science 2012;53:3717-3725. 101. Riss S, Heindl LM, Bachmann BO, Kruse FE, Cursiefen C. Pentacam-based big bubble deep anterior lamellar keratoplasty in patients with keratoconus. Cornea 2012;31:627-632. 102. Heindl LM, Cursiefen C. [Split-cornea transplantation - a novel concept to reduce corneal donor shortage]. Klinische Monatsblatter fur Augenheilkunde 2012;229:608-614. 103. Kruse FE, Laaser K, Cursiefen C, Heindl LM, Schlotzer-Schrehardt U, Riss S, Bachmann BO. A stepwise approach to donor preparation and insertion increases safety and outcome of Descemet membrane endothelial keratoplasty. Cornea 2011;30:580-587. 104. Heindl LM, Schlotzer-Schrehardt U, Cursiefen C, Bachmann BO, Hofmann-Rummelt C, Kruse FE. Myofibroblast metaplasia after descemet membrane endothelial keratoplasty. American journal of ophthalmology 2011;151:1019-1023 e1012. 105. Heindl LM, Riss S, Laaser K, Bachmann BO, Kruse FE, Cursiefen C. Split cornea transplantation for 2 recipients - review of the first 100 consecutive patients. American journal of ophthalmology 2011;152:523-532 e522. 106. Heindl LM, Riss S, Bachmann BO, Laaser K, Kruse FE, Cursiefen C. Split cornea transplantation for 2 recipients: a new strategy to reduce corneal tissue cost and shortage. Ophthalmology 2011;118:294-301. 107. Heindl LM, Hofmann-Rummelt C, Adler W, Bosch JJ, Holbach LM, Naumann GO, Kruse FE, Cursiefen C. Prognostic significance of tumor-associated lymphangiogenesis in malignant melanomas of the conjunctiva. Ophthalmology 2011;118:2351-2360. 108. Heindl LM, Hofmann-Rummelt C, Adler W, Bosch JJ, Holbach LM, Naumann GO, Kruse FE, Cursiefen C. Tumor-associated lymphangiogenesis in the development of conjunctival melanoma. Investigative ophthalmology & visual science 2011;52:7074-7083. 109. Damasceno RW, Heindl LM, Hofmann-Rummelt C, Belfort R, Schlotzer-Schrehardt U, Kruse FE, Holbach LM. Pathogenesis of involutional ectropion and entropion: the involvement of matrix metalloproteinases in elastic fiber degradation. Orbit 2011;30:132-139. 110. Cursiefen C, Heindl LM. [Perspectives of deep anterior lamellar keratoplasty]. Der Ophthalmologe : Zeitschrift der Deutschen Ophthalmologischen Gesellschaft 2011;108:833-839. 111. Heindl LM, Treutlein E, Junemann AG, Kruse FE, Holbach LM. [Selective lacrimal sac biopsy for external dacryocystorhinostomy: a clinical pathological study]. Der Ophthalmologe : Zeitschrift der Deutschen Ophthalmologischen Gesellschaft 2010;107:1139-1144. 112. Heindl LM, Kruse FE, Cursiefen C. [Complications after posterior lamellar keratoplasty (DSAEK): prevention, detection and treatment]. Klinische Monatsblatter fur Augenheilkunde 2010;227:478-482. 113. Heindl LM, Junemann AG, Kruse FE, Holbach LM. Tumors of the lacrimal drainage system. Orbit 2010;29:298-306. 114. Heindl LM, Hofmann-Rummelt C, Adler W, Holbach LM, Naumann GO, Kruse FE, Cursiefen C. Tumor-associated lymphangiogenesis in the development of conjunctival squamous cell carcinoma. Ophthalmology 2010;117:649-658. 115. Heindl LM, Hofmann TN, Schrodl F, Holbach LM, Kruse FE, Cursiefen C. Intraocular lymphatics in ciliary body melanomas with extraocular extension: functional for lymphatic spread? Archives of ophthalmology 2010;128:1001-1008. 116. Heindl LM, Hofmann TN, Adler W, Knorr HL, Holbach LM, Naumann GO, Kruse FE, Cursiefen C. Intraocular tumor-associated lymphangiogenesis a novel prognostic factor for ciliary body melanomas with extraocular extension? Ophthalmology 2010;117:334-342. 117. Heindl LM, Cursiefen C. [Retained Descemet's membrane after penetrating keratoplasty for macular corneal dystrophy]. Der Ophthalmologe : Zeitschrift der Deutschen Ophthalmologischen Gesellschaft 2010;107:55-59. 118. Heindl LM, Cursiefen C. [Pterygium. Etiology, clinical aspects and novel adjuvant therapies]. Der Ophthalmologe : Zeitschrift der Deutschen Ophthalmologischen Gesellschaft 2010;107:517-520, 522-514. 119. Heindl LM, Mardin CY, Holbach LM, Naumann GO, Kruse FE, Knorr HL. Vitreal seeding from uveal melanoma detected by high-resolution spectral-domain optical coherence tomography. Archives of ophthalmology 2009;127:1062-1064. 120. Heindl LM, Junemann A, Holbach LM. A clinicopathologic study of nasal mucosa in 350 patients with external dacryocystorhinostomy. Orbit 2009;28:7-11. 121. Heindl LM, Hofmann TN, Knorr HL, Rummelt C, Schrodl F, Schlotzer-Schrehardt U, Holbach LM, Naumann GO, Kruse FE, Cursiefen C. Intraocular lymphangiogenesis in malignant melanomas of the ciliary body with extraocular extension. Investigative ophthalmology & visual science 2009;50:1988-1995. 122. Heindl LM, Amann KU, Hartmann A, Kruse FE, Holbach LM. Orbital chondromyxoid fibroma. Archives of ophthalmology 2009;127:1072-1074. 123. Damasceno RW, Heindl LM, Szentmary N, Schlotzer-Schrehardt U, Kruse FE, Holbach LM. [Nodular fasciitis of the eyelid and anterior orbit in children: case report and review of the literature]. Der Ophthalmologe : Zeitschrift der Deutschen Ophthalmologischen Gesellschaft 2009;106:829-831. 124. Heindl LM, Schick B, Kampgen E, Kruse FE, Holbach LM. [Malignant melanoma of the lacrimal sac]. Der Ophthalmologe : Zeitschrift der Deutschen Ophthalmologischen Gesellschaft 2008;105:1146-1149. 125. Heindl LM, Naumann GO, Kruse FE, Holbach LM. Aggressive metastasising adenocarcinoma of the retinal pigment epithelium with trisomy 21. The British journal of ophthalmology 2008;92:389-391. 126. Heindl LM, Hofmann-Rummelt C, Schlotzer-Schrehardt U, Kruse FE, Cursiefen C. Histologic analysis of descemet stripping in posterior lamellar keratoplasty. Archives of ophthalmology 2008;126:461-464. 127. Heindl LM, Lotter M, Strnad V, Sauer R, Naumann GO, Knorr HL. [High-dose 106Ruthenium plaque brachytherapy for posterior uveal melanoma. A clinico-pathologic study]. Der Ophthalmologe : Zeitschrift der Deutschen Ophthalmologischen Gesellschaft 2007;104:149-157.